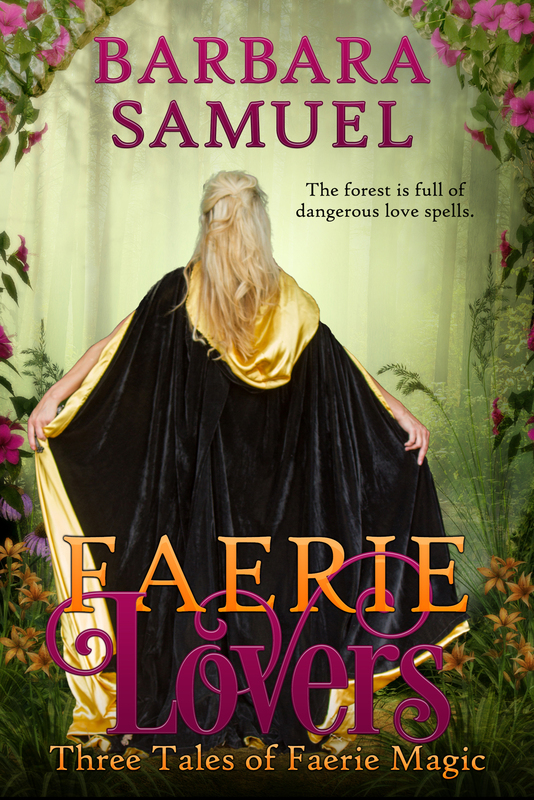 When Ciarann summons the fairy prince, she is unaware of the potent magic she is unleashing. The only one who can save her is a darkly handsome bard whose pure music finally opens her heart to love. Faery Lord Galen is cursed, condemned to a life of roaming misty glens and seducing human women to their deaths. But lovely, innocent Moira enchants him, and when he falls in love, the spell is broken. Deirdre is a woman so beautiful she drives men mad, and the young woman is promised to the king. On her way to wed him, she falls in love with a wildly handsome warrior who will challenge the prophecies of doom that surround her. Excerpt. © Reprinted by permission. All rights reserved. But only ceaseless sigh and tear? With stolen hope steal memory? Which all my heart is haunting still! A misery of alternating sleet and drizzle fell from the predawn sky. Laith of Inishmoor, wandering bard, cursed the darkness and the wet. All night he’d walked through the forest, fearing if he stopped for even a moment, he’d freeze. Now his worn cloak was sodden, and the rain had made of the ground a cold muddy muck that seeped through the seams of his shoes. He comforted himself by imagining hot soup and spiced cider in a kindly village or rath. The forest seemed to whisper about him. Laith remembered there was a fairy hill nearby, where once the sidh had made their homes. A clasp of gooseflesh crawled up his back, and he smiled at his own foolishness. A new god had come to Eire, washing away the magic and rituals that had been upon the land for as long as any could remember. Memories of the Other-world and the old ways grew dim, and all forgot the respect a bard of his standing would once have commanded. In the old times, Laith of Inishmoor would have been revered and feasted, and he would have wandered the land on a horse with ribbons braided into its mane and bells hung round its neck. Upon its back like a prince would Laith have ridden, his cloak a splendor of seven colors, a torque of red-gold around his neck. But the new god had swept magic from the land, putting in its place empty rituals, and Laith of Inishmoor, descended of the great bards of Eire, was only a poor wandering minstrel with a thin cloak and worn shoes and an empty belly. The forest thinned and he came to a wide grove cut through by a slim silver stream. Pausing on the edge of the field, he peered across, hoping for some sign of the village he knew to be nearby, or even a woodcutter’s cottage where he might be allowed to warm his feet for an hour or a day. Only the faintest lightening of the heavy clouds hinted that dawn soon would end this long night’s misery. His toes were blessedly numb, but the muscles of his limbs felt stiff with the cold. And he was hungry. In his pouch he carried half a loaf of a kindly goodwife’s bread, but a little butter might not go amiss. But no smoke scented the air, no friendly cow grazed. No hut perched cheerily at the other side of the clearing. Wearily, he sighed. Surely he could not be far now. Clutching his cloak more tightly around him, he lowered his head against the drizzle and moved forward. So deep was his misery that it took long moments for him to realize his feet followed a track of freshly flattened grass. He raised his head. The tracks ran in an arch toward a small rise topped by trees. Enlivened by the promise of shelter, he hurried along the tracks, eager to find the soul afoot this gloomy morn. He saw the cloak first—a blaze of scarlet nearly painfully bright against dim gray, then a spill of loose dark hair. A woman. He slowed, afraid he might frighten her away if he called out to her. ’Twas a time of battles and rogue soldiers, and a woman alone would be rightfully wary. She stood unmoving in the stillness. At her feet, a spring bubbled up between the roots of an ancient hawthorn tree. Laith moved closer, struck by her slim brightness against the dark day. There was an air of defeat about the set of her shoulders, a weariness Laith knew only too well. With his bard’s mind, he pondered what had led her to this cold place before dawn, what grief she carried. Perhaps her lover had spurned her, and once they had been happy in this place. Even as he thought it, she reached out with one white hand and touched the bark of the tree—but out of memory or a need for strength, he could not tell. Feeling an intruder, he half hid himself behind a tree. As he watched through a crotch of branches, the woman straightened suddenly. With a swift gesture, she unfastened the heavy brooch at her shoulder and flung aside her scarlet cloak. Beneath she wore only a thin kirtle that lay lightly upon a gracefully curved collarbone, and Laith saw her shiver in the cold. Protectively, she pulled her knee-length hair around her. Then—oh, then!—she reached for the ties at the neck of her shift, and tugged them free. The kirtle fell from her shoulders and caught at her waist, leaving her torso bare to the cold drizzle, and to Laith’s astonished and grateful eyes. She had very beautiful breasts, high and white and crowned with deep rose. A hundred times, a thousand, Laith had sung of speared hearts. Until this moment, he had not known the truth of the words. She looked like a pagan or a priestess with her sober white cheeks, the sorrow around her lips. It near wounded him to look upon her. He could not even find the breath to call out to her. She knelt at the small pool at the base of the tree and dipped her cupped hands into the water, then washed her breasts, letting the water cascade over the smooth white flesh. In the stillness, he heard her gasp. Slowly, she repeated the ritual. Without breath or heartbeat, Laith watched her, afraid to make even the smallest sound lest she cease her bewitching ceremony. Had he known anything of beauty till this moment? It was etched in the angle of her dark eyes, the small chin, in the fine bones of her shoulders and slim arms. Nor had he known desire. The sword in his heart was joined by a sword of an entirely different sort as he watched the path of her hands, dipping first into the water, across the small open space, over the bare and glistening flesh. The ritual tugged his memory—three times washing her breasts. He frowned, thinking. In a rush it came to him: ’twas said to be a way to open the door to the world of the faerie, who might then be coaxed to grant some wish. A bittersweet pang twisted in Laith. He wished that so fair a creature could bring forth one of the lost folk. But no more did fairies dwell in the deep forests of this land. The priests had chased them out of reach, where they had withered from lack of faith. Plainly, the woman at the well believed. Laith resolved that he would grant her wish when the fairies did not come. Perhaps she would even mistake him for one of their number. When she had anointed her breasts three times, she rose, tugging her kirtle to her shoulders once more. Fabric stuck to her damp skin, and her hair moved around her as if it had a life of its own. Once around the well she went, disappearing into the shadows behind the tree, emerging on the other side. As she completed her circle, Laith thought he saw a shimmer at the edge of the well, a shifting of light. He stared at the place, remembering the hill deep in the forest that was said to house the sidh. A taut excitement grew in his belly. But as she began to circle a second time, a quiver of unease mixed with the wonder, and he found himself moving cautiously from his hiding place, his intent gaze upon the changing light that was now undeniable. From the gloom emerged a silvery shape that grew brighter as the woman disappeared behind the tree. As she emerged again from the shadows, Laith saw the light take on shape and form. Another man, confronted with so magical a sight, might have been stricken to frozen wonder. Pure instinct, primed by a dozen generations of bards in his blood, drove Laith forward before he knew he would even move. He rushed toward her, his heart slamming against his ribs in terror as the silver coalesced nearby the well, taking the firm solid form of a man. The woman did not hear him. With a cry, Laith leapt across the spring, grasped her by the waist with no gentleness, and flung her to the ground before the third circle was complete. She cried out as she struck the earth. Laith landed atop her and heard the air rush from her lungs. His elbow struck a rock and he, too, grunted in pain. But those sounds were blotted out by an unholy roar of frustration. Laith clapped his hands over his ears, terrified. He wished to linger, to put his thumb against the swell of that wine red mouth and smooth away the sadness. A tear fell over her cheek. He wiped it away. Laith bolted up at the fearsome sound of that voice, and he whirled to face the being on the other side of the spring. And being it was, for he could never be mistaken for anything mortal—though it was a man in form, as tall and broad and sturdy as any warrior. A cloak woven of silver and gold hung from wide shoulders, and a girdle of precious stones belted a tunic of some shimmering fabric. Laith almost could not look upon the creature. He raised a hand, blinking. Palest gold hair fell around a face of unholy beauty, and the eyes were the color of moonlight. Purest wonder filled him for a moment. Wonder that such marvels still walked this land, that Laith should be so blessed as to see him with his own eyes. She shoved at him, her enormous eyes fixed with desperation upon the fairy. “ ’Tis you, minstrel, who do not understand.” The prince made to reach for her, but he could not penetrate the veil between the realms. He clenched his fists, then stepped back and lifted his chin. “You have won today, bard,” he said. A brittle smile turned his mouth. Laith held the woman firm, but fear struck through him. Now he would pay the price of his lust and impulsiveness. And he was gone. Once more the glade was still with a gray drizzle, and very cold, and Laith’s feet were wet in his shoes. He turned to the woman, whom he saw now was barely more than a girl. She stared at him, her eyes pools of welling sorrow. “What have you done?” she whispered. He opened his mouth to explain, but nothing emerged. He tried to whisper but his tongue seemed to have forgot the shape of words.